“To Be or Not to Be a Victim” from Christian Faith Publishing author D. J. S. S. Anderson is an easy-to-read handbook of advice and lists, dos and don’ts, and things to watch out for to develop a personal defense system and avoid being a victim in a modern world fraught with hidden dangers, as well as instructions on what to do when in compromising situations, personal attacks, and other emergencies. 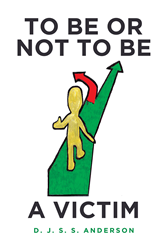 “To Be or Not to Be a Victim”: an instructive handbook for personal security. “To Be or Not to Be a Victim” is the creation of published author D. J. S. S. Anderson, a first-time author and married animal lover who owns two cats and two dogs. Anderson shares her conviction, “It’s not the same world we lived in where we could leave our front doors open in the evening to enjoy a nice breeze, or where, after breakfast on the weekend, your child could take off for the rest of the day with friends and not return until dark. "We must look at safety in a different light today. We must treat all strangers, basically, as possible criminals so we don’t fall prey to someone we do not know. We cannot trust or believe anything anyone we do not know tells us. No matter how polite they act, how good the offer looks, or how pleasant they sound, do not give out any personal information or money to them. Period. How many times have you heard about someone losing thousands of dollars because they believed what a stranger promised them? I cover more about this in the ‘Scams’ section. And scams are rampant. There are new ones occurring constantly with ways to get our personal information, our belongings, or us. Just because you’ve never been a victim doesn’t mean you won’t be targeted in the future. It can happen to anyone, even trained individuals. Published by Christian Faith Publishing, D. J. S. S. Anderson’s new book is a comprehensive, lightweight read—perfect for moments in the waiting room, or even to whip out in an actual emergency. Anderson tackles situations for the most at-risk sections of society, including children and seniors, offering critical insight into the minds of criminals, empowering the reader to fight back—and survive. View a synopsis of “To Be or Not to Be a Victim” on YouTube. Consumers can purchase “To Be or Not to Be a Victim” at traditional brick & mortar bookstores, or online at Amazon.com, Apple iTunes store, or Barnes and Noble. For additional information or inquiries about “To Be or Not to Be a Victim”, contact the Christian Faith Publishing media department at 866-554-0919.